Most reviewers get an outdoor jacket take it out back and throw a bucket over their head to see if it’s waterproof. We find such antics worthless. Hell a trash bag when worn properly could beat any jacket on the market in such worthless testing. I’ve spent enough time in places and weather that required a bomb proof jacket for my survival to know that a quick bucket of water isn’t a proper reassurance that when you’re at fourteen thousand feet, the temperture drops 60 degrees in 5 minutes and sleet starts rocketing at 70 mph in your face that your jacket’s got your back. So when Mountain Hardwear asked me to review their Carnic jacket last year I prepared for the long haul because a true all seasons jacket needs to be tested in all seasons. Right? I must admit, foremost, that I came into the review a little biased. I’ve had, for some time now, what I considered to be the ultimate outdoor bad weather shelter the Arc ‘Teryx Alpha SV jacket and as such I knew that it couldn’t be beat. Over the course of the year I was proven wrong. I’m 6’2″ and 185 lbs and the medium Carnic jacket is a perfect fit that allows room for a few layers beneath when it gets cold. 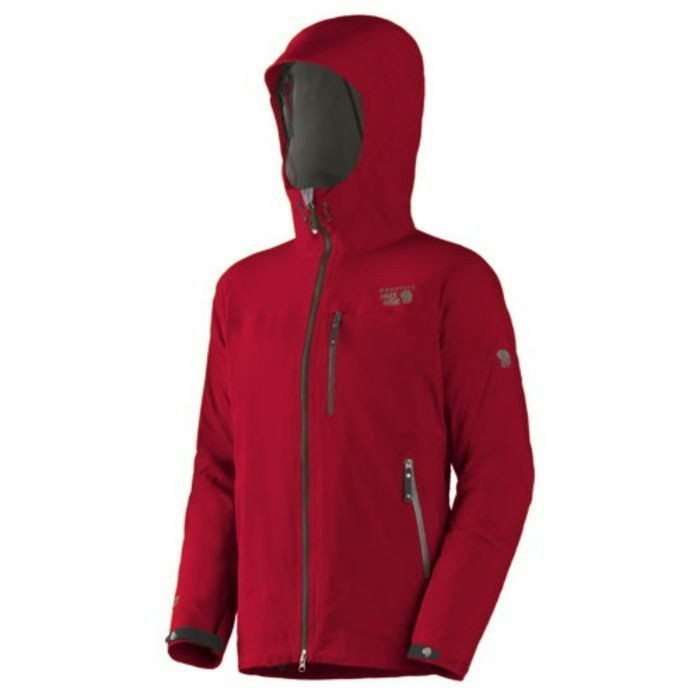 The jacket articulates exceptionally well and I could use my arms to climb and use tools without my sleeve running up my arm allowing water in. The waistband cinches closed nicely by way of pulls located within the front hip pockets, a particularly nice feature when it’s cold or rainy out and you don’t want to unzip the jacket in order to keep the wind or snow from getting under the waistband. Thanks to its ultralight three-layer Terra Shell fabric and welded seams, the Mountain Hardwear Men’s Carnic Jacket kept out even the harshest weather conditions time and time again. In the past the true challenge to a jacket has come after months of being worn under backpack straps, or beaten against bare rock, snow and ice. So I let the jacket have it all. And amazingly after a year of getting beat up and thoroughly challenged the jacket remains perfectly waterproof and still beads water like day 1. A jacket is worthless if it doesn’t breathe, because you just end up soaked in your own stinky sweat instead of rain. The Carnic’s super-breathable shell fabric and welded underarm zips helped keep my core temperature well regulated and dry. Another nice feature was the full-size hood which fit over my climbing helmet so I could climb without water pouring off my helmet and down my jacket. Overall, I was super impressed with the Mountain Hardwear Carnic jacket. How’d it fare when compared with the Alpha SV? I’d actually say it barely beat it. The Carnic jacket was every bit as bomb-proof, breathable and well-articulating with one advantage. It’s about half the weight and packs down to about half the size. Oh and it’s also about half the price. I think I have a new bad weather companion.